Today i.e. 22.06.2018, 3rd batch of Road Safety Summer Camp-2018 concluded at Children Traffic Park, Sector-23, Chandigarh. To sensitize the future drivers about road safety, Chandigarh Traffic Police is organizing Road Safety Summer Camp for school students in four batches. 3rd batch of summer camp was organized from 18.06.2018 to 22.06.2018. Total 43 students of different schools participated in this batch. During the summer camp, different activities like ‘Be seen Be Safe’, reflective colour during night driving, Road Safety Games were conducted and detailed information on road signs was also given, tips on safe cycling were given to the school children. A traffic drill was conducted by Traffic Cops as well as they were explained about pedestrian crossing. Guidance about first aid was also given them by medical staff of Police Hospital, Sec-26. The students were taken to Traffic Lines, Sec-29 and information was given about the function of CCTV Cameras and Challaning Branch. A session on safety riding theory was also conducted. On the concluding day of 3rd batch of Summer Camp-2018, Sh. 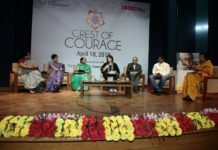 Shashank Anand, IPS, SSP–Security & Traffic was the chief guest, who addressed more than 50 participants about Road Safety and distributed certificates and Traffic Cop Magnets among them. During the camp, plethora of activities were conducted to imbibe traffic rules in the young generation. A post test of the participant children was conducted to know their feedback. An activity of simulation goggles was conducted involving the school children, so that they may make understand their parents, family members and known persons about the bad effects of drink and drive. All students participated enthusiastically in the camp and were excited to be a part of it. Sh. Rajeev Ambasta, DSP-Traffic (South, R & D), Smt. Sita Devi, Inspector (I/C–CTP & Social Media Cell) and Traffic Marshals Sh. Inderpal Singh Sidhu and Smt. M.K.Kataria were also present. All the children, officers and staff also took pledge that they will follow traffic rules vigorously and shall also inform their parents, brother and sister, friends and relatives to follow Road Safety Rules. In the post test, school children who stood 1st, 2nd & 3rd were given prizes by Sh. Shashank Anand, IPS, SSP–Security & Traffic. 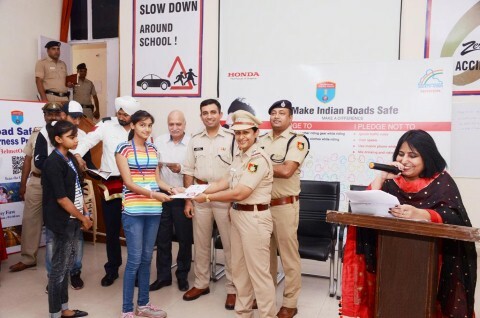 However, participation certificates and statue of traffic cop magnets were distributed to all the participant students for their future encouragement. Previous articleGGDSD College Kheri Gurna Conducts a Workshop in collaboration with Cooperative Societies,Punjab Govt.